There were plenty of gift sets on display, but what really caught my eye was this Origins Christmas bauble. 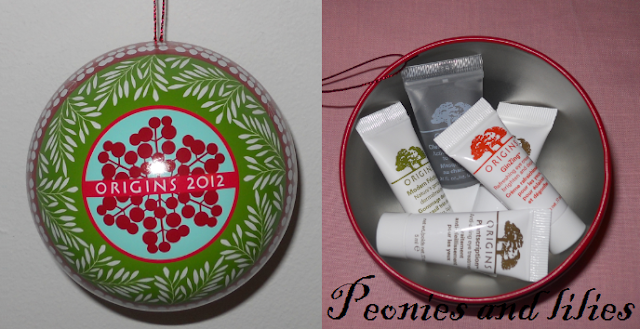 I'm loving the trend for beauty inspired tree decorations and inside this particular bauble, you'll find 5 of their best selling products: Plantscription anti-ageing serum, Plantscription anti-ageing eye treatment, Clear improvements active charcoal mask, Modern friction nature's gentle dermobrasion and GinZing refreshing eye cream. Admittedly they're all sample sizes, but it's such a nice idea and at £6 (or 2 for £10), it'll make for a cheap and cheerful stocking filler. Other gift sets that caught my eye were the Mask marvels (which contains 2 of my favourite face masks) as well as the Let it glow gift set, which comes with a full sized pot of their much raved about GinZing eye cream. 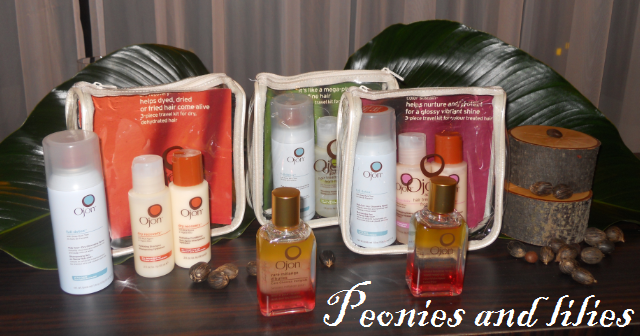 Finally, this Christmas, Ojon are bringing out 3 gift sets, each specifically designed for a particular hair type. The gift sets retail for £20, and will come with a mini dry cleansing spray, shampoo and conditioner. I'd also highly recommend the Ojon Rare blend oil. Not only is the tri layer visually appealing, it also smells amazing and never fails to leave my hair soft and silky. Did any of these gift sets catch your eye? What on your wishlist this Christmas?